it is very elegant and bold. i love that the earrings matches with necklace pendant which suits every dress or formal attire. i dont use it everyday but so far i can say it is not cheaply made. Complement your classic outfit with this pearl stud earring and necklace set. 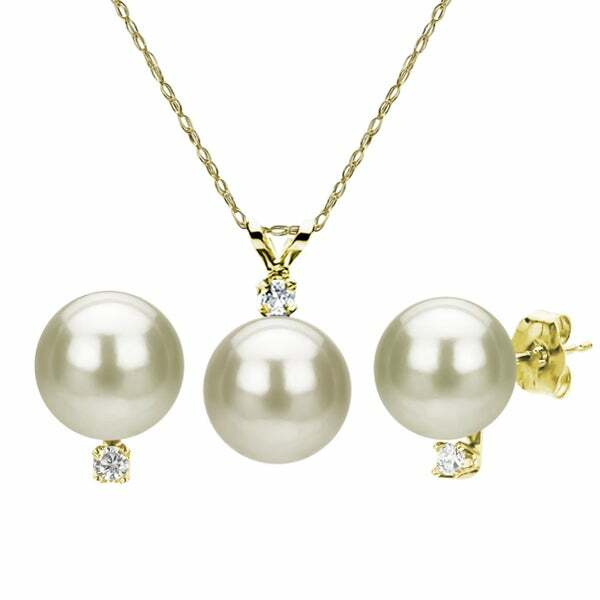 This jewelry set features 14-karat yellow gold, three diamonds, and three Akoya cultured pearls. The necklace and earrings feature a single pearl with a round diamond nestled underneath it. Dimensions 9.0 In. X 6.0 In. X 3.0 In. I bought this for myself. It is a very lovely necklace and earring set. It came in a little plastic bag and the very thin light weight chain was in so many knots it took me almost 2 hours to unknot the it. It looks really nice and I love pearls. The diamond is very very small, but I bought it for the pearl so the size of the diamond is unimportant to me. The Pearls are beautiful. First, I will say that I'm no expert in pearls and that I AM keeping this set. I think the set is worth what I paid and I want to avoid the charges for returning. However, I am disappointed with the quality of the jewelry. The earrings and necklace look a bit off when they're on because the metal is easily bent. (As another review said, the pendant hangs a bit crookedly.) I bent one earring so the position of the (tiny) diamond would match the other. Clearly, the gold is not of high quality, and the pieces look like they were cheaply soldered together. The pearls are pretty, but I think some freshwater pearls I got from Overstock are nicer (and cheaper). I also am afraid an earring could easily fall off, and the chain is VERY thin. (But I like the way this looks, because the pearl looks like it's floating since the chain is almost invisible.) All in all, I don't think this is a BAD value, just not a great one. I am going to think of this set as nice costume jewelry, not something to get really attached to (because something could easily get lost). I wouldn't use this for everyday either, for that reason. I ignored the other negative reviews... and now I wish I hadn't! While the pendant and earrings are pretty and of fairly good quality, the pearls and diamonds are tiny--you can barely see the diamonds. This set would look foolish on an adult. Luckily, I bought these for a niece's Christening--perfect. I usually buy a strand of Akoyas with matching earrings for that type gift, but the Akoyas are getting very pricey for a decent strand, and these are a reasonably-priced, suitable substitute. I bought this earring for myself. I love pearls! For the amount that I paid this pearls are worth it. I actually didn't expect it to come with a chain because it is already cheap as it is. I am using it with a thicker gold chain and had one of my daughter wear the thinner chain. My sister is getting married in December and I had told her to consider this set to give to her bridesmaids. I love the size and the color of the pearls. The diamonds are tiny. The chain is thin. I still have the set. I only wear it for the occasions. I don't want the chain to break on me. The pearl is really nice but the diamond can hardly be seen! I bought a set of these for each of my bridesmaids as part of their gift. They wanted something simple and elegant to wear on my wedding day. This was prefect. The pearls are of great quality. I think they will look perfect for the big day. As others had mentioned, the gold chain is thin. I also agree that it looks like the pearl is floating around your neck, which is a pretty look, however, it might be a good idea to buy a stronger chain. Overall, I am very pleased! This is a perfect gift to my 21 year old daughter. it is simple but elegant. I bought these for my little one for a wedding and they look just like they are online. The quality is great for the price and I looked great. I got this set for my little sister. Is a perfect gift. She loved it. chain is very delicate but pearls are nice. "Is this real diamond? " a good quality necklace for my daughter.